YouTube is opening up its auto-caption feature to everybody, a move that benefits not only deaf users, but also people who watch videos in really noisy places, like airport terminals. And since the tool will be able to translate captions into your choice of 50 languages, it should be handy for viewing YouTube clips from around the world. For now, however, auto-captioning works only with videos in English. 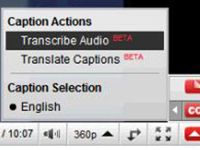 Auto-captioning borrows some text-to-speech algorithms from Google Voice Search to automatically create captions upon viewer request. As one would expect from machine-generated captioning, the results aren't perfect, but they're fairly accurate for formal presentations and keynote-type speeches with minimal background noise. In other words, auto-captioning gives you a pretty good idea of what's being said, although some of the finer points may be misleading or just plain wrong. On the plus side, a video owner can download the auto-captions, clean them up, and upload a corrected transcript. PC World has contributed to the report.